As a mother of a budding artist, I understand how art can communicate to the soul. As a matter of fact, if you look at any picture, drawing, or painting that “speaks” to you, more often than not you will find it has a message that stands out. Lennox is leading in this. They are using art to communicate about their home systems, and how they can save you money, run efficiently, and yet be the quietest on the block. Often in the summer, you can stand outside and hear all the humming of the air conditioners pounding away. Of course that can mean hundreds of dollars in electricity bills. But, with a Lennox system, you will find that you can SAVE money with it. How? 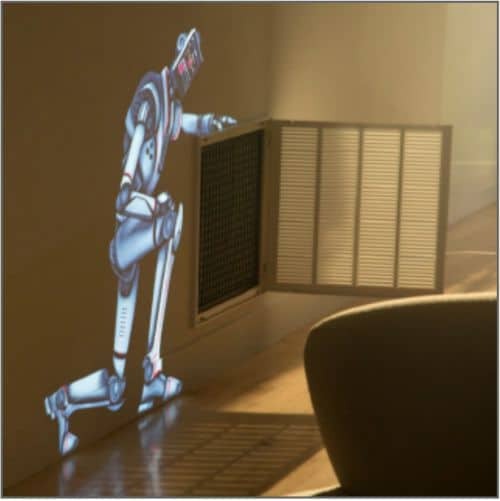 Easy, with the iComfort S30 Robot. It’s a wireless-enabled touchscreen thermostat. 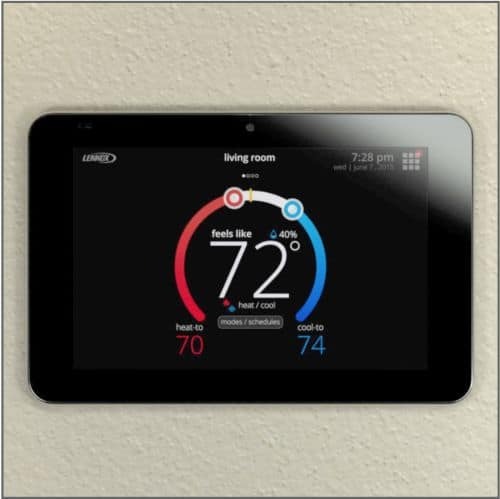 It controls your entire system from the wall, like a standard thermostat, while also allowing you to monitor and adjust your temperature from anywhere in the world, using smartphone, tablet or laptop. Remote access, along with live weather forecast and automatic updates, offers a level of convenience that goes beyond what’s possible with a standard thermostat. Alerts and reminders sent to you via email or accessed through your mobile app tell you if there’s a problem with your system or maintenance is required. With your permission, messages can be sent to your Lennox dealer. It helps to keep your home a comfortable temperature constantly, taking into account humidity levels and keeping it a real feel. 72° is really 72°. It also takes into consideration the pollen levels in your area by zip code (amazing technology here!) and keeps the fan circulating to clean the air. That’s great news for those with allergies! In short, The Lennox iComfort® S30 thermostat can sense changes in your environment—it even knows when you come and go and adjusts accordingly. So now your home’s most important system is also the smartest. flowing. This is definitely something to check out; especially when we move in the next year or so! Lennox and A’Shop were a fantastic collaboration. I’m totally smitten with Robot and will now forever associate him with the Lennox systems! I think the artwork used with the Lennox campaigns is what really makes it interesting… That and the awesome energy-saving features of the products! I love the idea of saving money with my thermostat! It’s so true that art can speak to the soul. Lennox is doing a great job communicating their message using art! I am amazed how quiet these units are compared to older ones. It’s nice to see that a company cares enough to make their products as consumer friendly as possible. I absolutely love how they incorporate art into what they do! I’ve always wanted to own a robot, now’s my chance.. I love all of the wonderful features offered by Lennox. I definitely am hoping to be able to purchase a Lennox system in the near future! I don’t know what I love more, the features of the Robot or the artwork that has brought it to life! Awesome system and think of the money you will save with the iComfort S30. I love my Lennox unit! !